You'll love a stack of simple bracelets that incorporate favorite finds from your vacation. This bracelet is great for summer or anytime you want to be reminded of the beach. 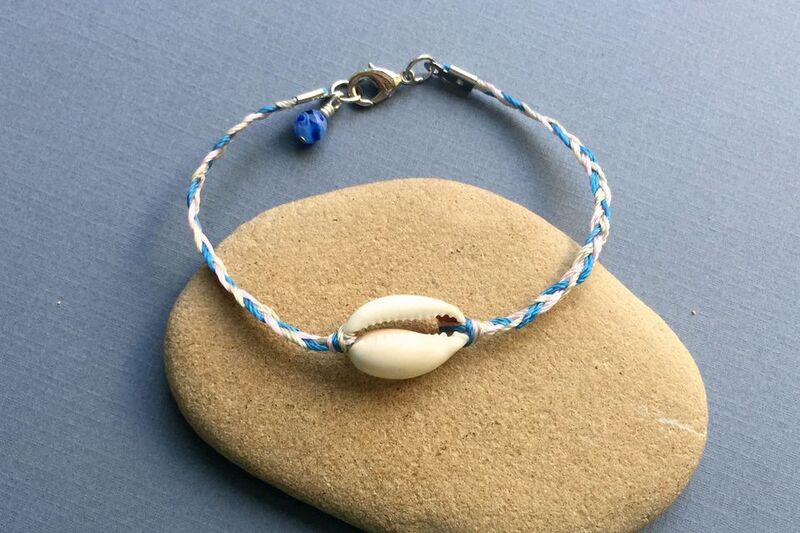 It uses several colors of Nylon cord braided around a slide of a cowrie shell. 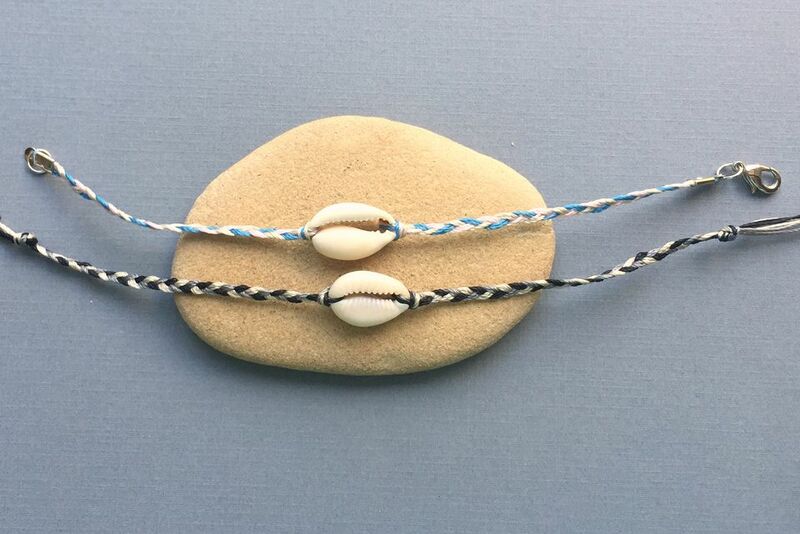 For a casual seaside bracelet, use C-Lon Nylon bead cord, .5mm diameter. C-Lon is a bonded nylon cord that comes in a variety of sizes and colors. It is perfect for a variety of beading and braiding projects including kumihimo, micro-macrame, crochet or working with size 8 seed beads or larger. There are many similar types of beading cords that will work including S-Lon, Conso, Mastex or Tuff Cord. The shells we are using are slices of cowrie shells. These are easy to find in souvenir shops or online and they are interesting from either the front or back. C-Lon cord in beige, black and gray is being used above. Cut 2 pieces of each color of cord, each about 14 inches in length for a total of six pieces of cord. Make two groups of cords with three pieces of cord in each. One thing that can be difficult is the amount of curl in the cords when they are removed from the spool. The cords are more likely to tangle when they are all curled right off the spool. A couple of solutions we have found are to iron the cord lightly on low with a clothes iron. Another option is to use a hair straightener on low or when it has just started heating up. A couple of zips over the group of cords on a low-temperature setting is all it takes to make them perfectly straight. Fold the cords in half and insert into the center of the cowrie shell. You will find that one end of the shell typically has a wider opening than the other, Insert the cords in this side and slide them over to the other side. A simple and pretty way to secure the cords is with a lark's head knot. Pull the folded side of the cords far enough through the shell so you can slip the ends of the cord through the loop. Pull the cords through the loop and pull with even pressure to secure. In order to make it nice and neat, be sure to tug lightly on each individual cord end after you have tightened the lark's head knot. It will help to tighten the knot and make the cords lay more evenly. Attach the second group in the same way. Make sure you insert the loop of cords in the same direction you did the first time. Above, the cords are put through the front of the shell, but you can decide which way looks best to you. It is convenient to place the side of cords that you are not working with under a strong clip. You can use a binder clip against a book or a clipboard as seen above. Separate the cords by color into three groups of two cords each. Make a braid in the same way that you would braid hair. Bring the right outside cord over the top of the middle thread, moving it to the middle. Then take the left outside cord and move it over the center cord, making it the new middle cord. Continue by bringing the right cord over to the left and left outer-most cord to the right until you have about 3 to 3.5 inches of braid. When you have reached the desired length, make an overhand knot with the cords. Unclip your bracelet and turn it so you can braid the other side. Repeat until it is the same length as the first side. Tie an overhand knot to secure the braid. One thing that can be difficult is tying an even overhand knot when you are working with multiple cords. It is much easier if you tape the cords together evenly so you can work with the group as if they are a single cord. If you use a less tacky tape like painters tape, it will be strong enough to hold the cords together but will not leave a sticky residue on the cords. Once you have made the knots that hold the braid in place, you can tie on your bracelet. If you prefer to have a clasp on your bracelet, you can use fold over cord ends like this donut bead bracelet. When you use a clasp, you might also like to add a bead dangle as a counterweight to keep the bracelet clasp hidden on the bottom of your wrist. Another option to close your bracelet is to add a macrame slide which will hold the cords in place and allow you to loosen and tighten the bracelet.